The Genaray SpectroLED SP-S-800D Daylight Studio LED 3-Light Kit was put together by B&H to give image-makers the benefit of a 3-light setup with variable light intensity and power options that are an asset in the studio or on the road. 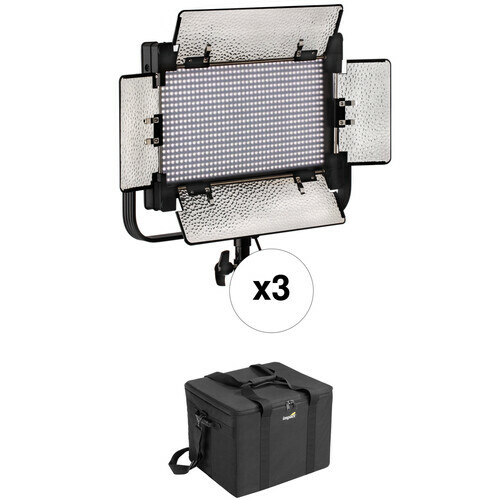 The kit contains three 13 x 6.75" SpectroLED SP-S-800D Daylight Studio LED panels, each with a 4-way barndoors, a diffusion filter, a tungsten conversion filter, a yoke, an AC power adapter, a V-Mount battery plate, a wireless remote control with a 65' range, and an individual carry case. An asset in the studio or on location, the 13 x 6.75" panel SP-S-800D SpectroLED Daylight Studio LED Light by Genaray employs 800 LEDs for output that's 5600K-balanced for daylight shooting or to match other fixtures that are daylight-balanced. A high CRI/TLCI of 95 indicates faithful and accurate rendition of color. The fixture comes with a removable tungsten-conversion filter that allows you to seamlessly blend in with traditional fixtures or for shooting in venues dominated by tungsten light. Light intensity is variable from 100-10% both locally on the SpectroLED SP-S-800D, or remotely at distances up to 65' with the included wireless remote control. Settings are displayed on the light's back panel LCD screen. The 800D ships with removable 4-way barndoors that limit spill light and allow you to further control the light's tight 45-degree beam spread to illuminate parts of your subject that you want and keep the light from areas where you don't. The barndoors have removable textured inserts that ensure maximum output while lending a slightly specular, snappy quality of light. Remove the inserts if you prefer a softer look. The SpectroLED SP-S-800D has a yoke that permits tilting when stand mounting with its 5/8" and 1-1/8" combo receiver/pin. The receiver offers an additional benefit accessed by removing the tightening knob which converts the receiver to a 1-1/8" pin for stands with a Junior receiver. The SpectroLED SP-S-800D Bi-Color is ready for worldwide use thanks to its included multi-voltage 100-240 VAC adapter but you can also take advantage of the light's V-mount battery plate to operate the light on optional batteries when mains power is unavailable. With a color temperature of 5600K, the 800D blends in seamlessly in daylight venues or with other daylight-balanced fixtures. A tungsten conversion filter is provided to for match situations with warm color temperature or just for creative use. The Spectro-LED 800D is conveniently dimmable from 100-10% to ensure the ideal light level for your requirements. The high CRI/TLCI rating of 95 indicates faithful and accurate color rendering. Flicker-free output allows you to shoot at a high frame rate for slow motion. The Spectro-LED 800D runs on the included multi-voltage 100-240 VAC power supply or on optional V-mount batteries when mains power is unavailable. Adjust intensity from distances up to 65' with the included wireless remote control. The Spectro-LED 800D has a combination 5/8" receiver / 1-1/8" pin for stand mounting. The removable 4-way barndoors have textured silver inserts for enhanced output that can be removed for a softer look. The barndoors provide control of the light's tight 45-degree spread. Box Dimensions (LxWxH) 21.0 x 18.6 x 6.2"